Come On Facebook NOT AGAIN! Come On Facebook NOT AGAIN! Come On Facebook NOT AGAIN! Facebook’s take down a page helping Veterans who suffer from PTSD. Soon all that will be left for Facebook to block will be pages dedicated to helping widows and orphans. Whether the powers that be will find something in these pages that violate their community standards remains to be seen. Julie Leonard, the site’s founder, is the mother of a PTSD sufferer. She herself also suffers from the condition. “I am a strong advocate for all our military, veterans, their families and all those who are affected by PTSD,” she told us in an email. I want to give something back to all those who have sacrificed and given us so very much. I saw the need for an international page which would give all who struggle a stronger voice and a sense of unity, so that their struggle is felt by their brothers and sisters across the world. I believe that our page is the only dedicated international support page on Facebook to date. I have PTSD but it does not have me. That is why the page exists, a keeping of my oath to stand with them till the end and spit in the Reaper’s eye along the way. 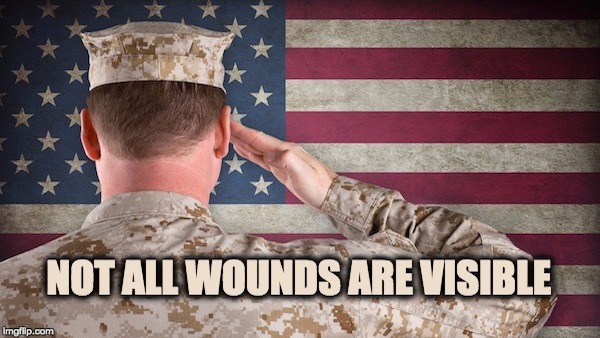 We serve those with a patriot heart and a connection to PTSD. To admin for us you must have that. PTSD or an intimate connection with someone that does as we get messages from people looking for help. You must understand it and them. That is our connection. The lifeline in the literal sense. We have kept several busy while we sent help to prevent their suicide, which makes this all the more reprehensible. Worse yet, administrators say they have been banned for anywhere from three to 30 days. According to Troisi, Facebook retaliated almost immediately after they appealed the initial teardown. A new page has been set up and can be seen here. This, not the first time something like this has happened, as we reported back in 2014. All of the page administrators for the “Military with PTSD” Facebook page were banned for at least 12 hours over a post about God and religion that was put up by a veteran user, WFIE reported Saturday. WFIE said the page, now with over 22,000 supporters, was started by Shawn Gourley, of Evansville, Ind., after her husband was diagnosed with the disorder. Gourley said the page has given her a chance to help families of veterans and veterans suffering from PTSD, some of whom, WFIE said, were on the brink of suicide. But someone posted a comment about God and religion, and that apparently didn’t sit too well with Facebook monitors. “Facebook notified Shawn, telling her the post has been removed because it violates the site’s community standards,” Sean Edmondson reported. According to Edmondson, all of the administrators were banned for at least 12 hours, affecting a number of veterans and family members who rely on the page for support and information. “If we don’t have their number, we can’t access them at all. Someone posted on my personal page that they felt like the walls were closing in on them and they didn’t know how much longer they can hang on and I can’t respond to her. I can’t tell her to call me…anything,” she said. “We could be burying another vet,” Spaulding said. 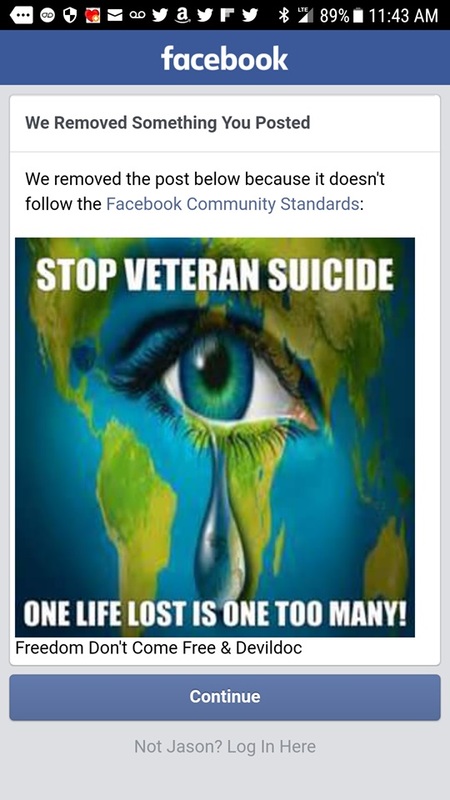 In 2016, the Military Times reported that a study by the VA says “roughly 20 veterans a day commit suicide nationwide.”… Page administrators are quick to emphasize that even one suicide a day is one too many — which was the point of the image Facebook tore down. And despite their actions, Leonard says the fight to save veterans’ lives will continue. “No matter what they do to us we will keep on fighting, we will keep on supporting, we will keep on trying to save lives,” she said. As Adina Kutnicki, an investigative journalist based in Israel, and I documented in our book, “Banned: How Facebook enables militant Islamic jihad,” the reason censorship like this takes place is that federal law sanctions it. In 2014, a federal judge ruled that Section 230 of the Communications Decency Act of 1996 lets sites like Facebook censor even Constitutionally-protected speech with zero legal consequences. This means the beatings and harassment will continue until Congress takes action to amend that section of the law. We reached out to Facebook but have not received a response as of this writing.